It's International Holocaust Remembrance Day, and 73 years to the day since Auschwitz was liberated. The Polish right can pretend that only Germans, and none of their own countrymen, committed atrocities against the Jews, during the war, but they're not going to erase the world's memory. 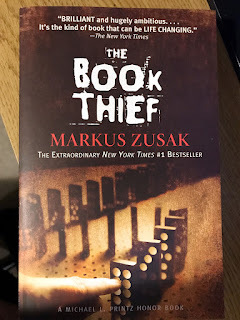 Anyway, to do my own little bit of remembering and commemorating, I'm going to re-read Markus Zusak's "The Book Thief," a great book recommended to me by a friend, Theresa, seven or eight years ago. No, I didn't steal it. I haven't read it since that first time, and I think tonight'll be a good time to start it over.